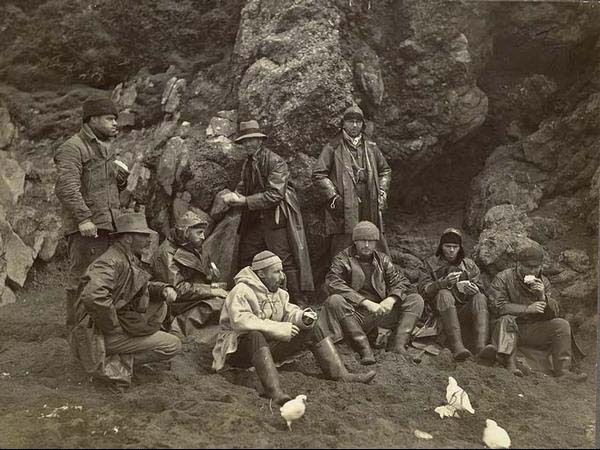 Scientists taking a mid-day snack while collecting at the Crozet Islands (la pause des scientifiques). Debout (de gauche à droite) : J.W.S. Marr, Pr. Harvey Johnson, Dr. W.W. Ingram. Assis : M. Moyes, E. Douglas, S.A.C. Campbell, Sir Douglas Mawson, R.A. Falla & H.O. Fletcher.